Substructure's epoxy pump on a work site in Mexico. Over a number of years, substructure engineers applied their field experience and extensive expertise in epoxy encapsulation application to develop (and patent) three generations of advanced systems for pumping high-aggregate, plural-component, epoxy products. Our latest epoxy pump includes a dual-cylinder assembly capable of pumping two high-aggregate mixtures with different viscosities. The innovative design addresses all of the problems common with other types of pumps on the market. 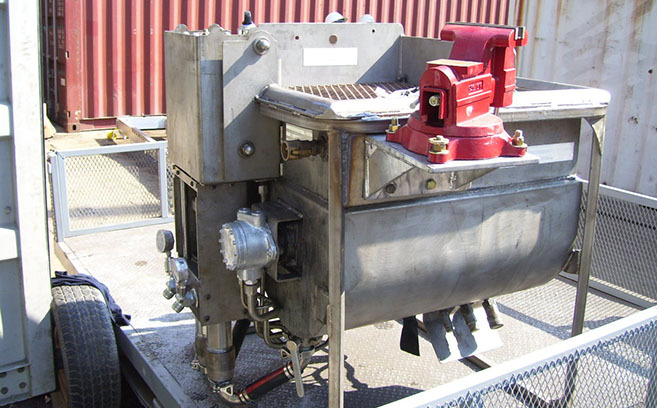 The auger assembly and hopper configuration ensure proper mixing, with minimal settling and aeration, minimal hopper residue, and continuous stable action of the auger blades. The hoppers are thermally regulated, the upper hopper assembly is at an ergonomically correct height, and all moving parts – including the augers – are covered to dramatically reduce the risk of injury. The pumps, constructed to be far more wear resistant than conventional pumps, were designed and assembled so field repairs can be accomplished quickly and easily (primarily replacing modules containing the parts most subject to wear). Our patented (USPTO Patent #7357564) pumping system is compact, efficient, safe, and reliable. Understanding that high-pressure pumping of epoxy blended with abrasive aggregates is a recipe for excessive wear, the design revolves around robust components and ease of in-the-field maintenance and serviceability. US patents are currently granted on both the pumping system and the static mixer utilized for combining the epoxy components and aggregate.